CNG: Printed Auction CNG 75. INDIA, Gupta Empire. First Dynasty. Chandragupta II Vikramaditya. Circa AD 380-413. AV Dinar (7.69 g, 12h). Horseman type. Sale: CNG 75, Lot: 717. Estimate $750. INDIA, Gupta Empire. First Dynasty. 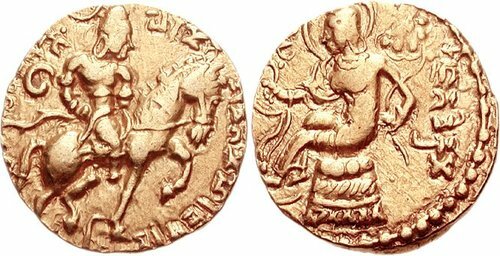 Chandragupta II Vikramaditya. Circa AD 380-413. AV Dinar (7.69 g, 12h). Horseman type. Chandragupta, nimbate and wearing only waistcloth, riding prancing horse right / Lakshmi, nimbate, seated left on wicker stool, holding diadem and lotus; tamgha to left. BMC Guptas 127 (same obv. die); Alketar Class II, Variety A; Bayana 1075. VF, some areas of flat strike. Rare.